Most Octobers find us on Jekyll Island for a week or so, to enjoy the gorgeous weather and the beach at its finest season. The days – and the ocean – are warm enough for swimming and the nights are just cool enough to make you enjoy the breeze. We always make it a point to visit JIBS – the Jekyll Island Banding Station – for a couple hours during our stay. I enjoy the chance to see birds up close and I also like hanging out with the folks who run the station. Often, it’s the only time I see these friends all year. It feels good to hang out with others who are as nerdy about birds in their own way! 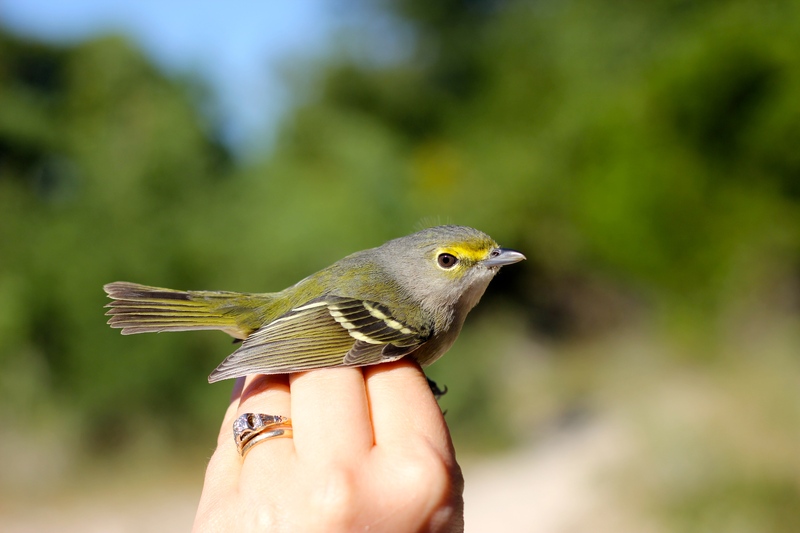 Our timing was off somewhat this year, in that most of the days were “slow”, but still the common birds are especially beautiful when you can appreciate the fine details of their feathers (like those of the white-eyed vireo pictured here) up close. I come away from any visit having learned something new. It might be easy to wonder about the benefits of bird-banding, at least until you find a banded bird in the field yourself. 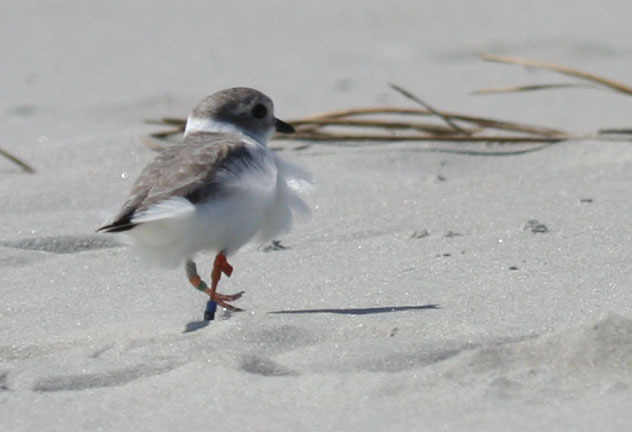 Information on migration, mortality rates and range are some of the things that researchers learn from banding. Another must-visit-place is Gould’s Inlet on St. Simmons Island; I go there to enjoy the birds at low-tide. I’m always hoping to see a couple Piping Plover. Each year, I look for PIPLs that are banded, as the inlet is a popular place for wintering birds. I’ve found 3 banded birds there, and at least a dozen others in t he couple years I’ve visited during the month of October. I report the band combinations and in return find out a little info about the bird. Two of the three banded birds are from the Great Lakes and this year we saw a bird from the Great Plains population. Especially interesting is the PIPL in the photo – I first saw this bird (hatched on the UP of Michigan in 2007) in 2012 and we saw it again this year! It’s 7 years old and apparently spends every winter at Gould’s Inlet. This bird, too, feels like an old friend almost, one that I can only recognize because of the colored bands on its legs. Pretty cool, huh?